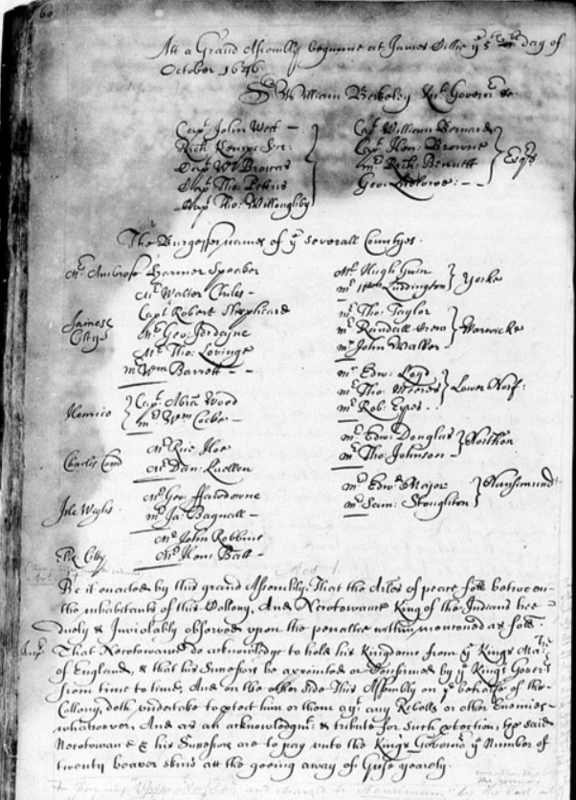 In 1646, two years after Opechancanough ordered coordinated attacks on English settlements that killed about 500 people, the government of the colony and Necotowance, on behalf of the Powhatan tribes, negotiated a treaty that ended hostilities between the remnant of the Powhatan and the English Virginians. Later in the year, the General Assembly enacted the treaty into law and adopted other laws to enforce its terms. From that time on in Virginia and also elsewhere in the colonies, governments and Indian leaders negotiated treaties that allowed people of European origin or ancestry to settle in areas that Indians had formerly occupied. Often a part of concluding periods of open hostility or organized warfare, the treaties established a legal doctrine that Indians did not bear the same relationship to the colonial governments that free white men enjoyed. In some respects, colonial laws and practices treated Indians as foreign nations. In other respects, as when Indians resided in or near European settlements, they were not accorded the full rights of free white men. In the case of the Treaty of 1646, the affected tribes were known as tributary nations because they were required to pay tribute to the victors who had imposed the terms of the treaty. As a result, Indians were exempted from taxation, which in the popular mind was associated with the annual tribute of beaver skins paid to the government. Page 1 of the treaty is shown below. Unfortunately, this is not a signature document. Be it enacted by this grand Assembly, That the Artes of peace foll[owing] between the inhabitants of this Collony, And Necotowance King of the Indians bee duely & Inviolably observed upon the penaltie within menconed5 as foll Imps That Necotowance do acknowledge to hold his Kingdome from the Kings Ma[jes]tie of England, & that his Successors be appointed or Confirmed by the King’s Goverrs from time to time: And on the other side This Assembly on the behalfe of the Collony, doth undertake to p[r]otect him or them ag[ains]t any Rebells or other Enemies whatsoever, And as an acknowledgmt & tribute for such protection, the said Necotowance & his Successors are to pay unto the King’s Governor the Number of twenty beaver skin’s att the goeing away of Geese yearely. That it shall be free for the said Necotowance & his people, to Inhabit & hunt on the Northside of Yorke River without any interruption from the English provided that if hereafter, It shall be thought fitt by the Governor & Council to permitt any English to Inhabitt from Poropotanke downewards that first Necotowance be acquainted therewith. That Necotowance & his people, leave free that tract of land Betweene Yorke River & James River from the falls of both the Rivers to Kequotan to the English to inhabitt on, & tht neither he the said Necotowance nor any Indians do repaire to or make any abode upon the said tract of land upon paine of death & it shall be lawfull for any person to Kill any such Indian, And in Case any such Indian or Indians being seen upon the said tract of Land shall make an escape, That the said Necotowance shall uppon demand deliver the s[ai]d Indian or Indians to the Englishmen, upon Knowledge had of him or them, unles such Indian or Indians be sent upon a Message from the said Necotowance. And to the intent to avoid all injury to such a messenger & that no ignorance may be pretended to such as shall offer any Outrage, It is thought fitt & hereby enacted That the badge worne by a messenger, or in Case there shall be more than one by one of the company, be a Coate of striped stuffe which is to be left by the Messenger from time to time so often as he shall returne at the places appointed for their coming in. And it is further enacted That in Case any English shall repaire contrary to the Articles agreed uppon to the said Northside of Yorke River, such persons soe offending being lawfully Convicted be adjudged as Felons; Provided that this article shall not extend to such persons who by stresse of weather are forced upon the said Land, Provided alsoe & it is agreed by the sd Necotowance, that it may be lawfull for any Englishman to goe over to the sd Northside of haveing occasion to fall timber Trees or Cut sedge, soe as the said persons have warr[an]t for theyre soe doeing under the hand of the Govr Provided alsoe Notwitstandinge any thing in this Act to the Contrary That it shall bee free & lawfull for any English whatsoever between this present day & the first of March next to kill & bring away what Cattle or hoggs tht they can by any meanes Kill or take upon the said Northside of the said River. And it is further enacted that neither for the said Necotowance nor any of his people, do frequent, come in to hunt or make any abode nearer to the English plantations then the Lymits of Yapin the black water & from the head of the black water upon a Straite line to the old Monakin Towne upon such paine & penaltie as aforesaid. And it is further ordered Enacted that if any English do entertain any Indian or Indians or doe conceale any Indian or Indians that shall come within the said Lymits, such persons being lawfully Convicted thereof shall suffer death as in case of Felony, without benefit of Clergy excepted such as shall be authorized thereto by vertue of this Act. And it is further Enacted that the said Necotowance & his people shall upon all occasions of message to the Govr for trade, doe repaire unto the Fort Royall onely on the Northside, at which place they are to receive the aforesaid Badges, which shall shew them to be Messengers & therefore to be freed from all injury in their passage to the Governor upon payne of death to any person or persons w[ha]tsoever that shall kill them, the badge being worn by one of the Company, And in case of any other affront, the offence to be punished according to the quality thereof, & the trade admitted as aforesaid to the said Necotowance & his people with the Commandr of the said Fort onely on the Northside. And it is further thought fitt & enacted that upon any occasion of Message to the Governr or trade, The said Necotowance & his people the Indians doe repair to Forte Henery al[ia]s Appamattucke Forte, or to the house of Capt John Floud & to no other place or places of the Southside of the River, att which places the aforesayd Badges of striped stuffe are to be & remaine. And it is further thought fitt & enacted That Necotowance, doe with all convenience bring in the English Prisoners, And all such Negroes & Guns which are yet remaining either in the possession of himselfe or any Indians and that he redeliver upon demand such Indian Servants as have been taken prisoners & shall hereafter run away, In case such Indian or Indians shall be found within the Lymitts of his Dominions provided that such Indian or Indians be under the age of twelve years at theire running away. And it is further enacted & Consented That such Indian children as shall or will freely & voluntarily come in & live with the English, may remain without breach of the art Articles of peace, provided they be not above twelve yeares old. And it is further thought fitt & enacted That the severall Commanders of the Forts & places as aforesaid unto which the said Indians as aforesaid are admitted to repaire In case of trade or Message doe forthwith provide the said Coats In manner striped as aforesaid. This entry was posted in Powhatan, Treaty. Bookmark the permalink.